How is everyone doing on New Year’s Resolutions? Losing steam? Me too. I went out for all 3 meals yesterday (terrible!) and may have had 1 more glass of wine than was strictly necessary. I truly do believe that life is about balance, though, and so rather than beat myself up over yesterday’s indulgences, I woke up excited to make a breakfast full of nutrients, antioxidants, and fiber. Doesn’t hurt to make it easy on the eyes, either. This breakfast was light and filling at the same time. A sweet way to start the day. Blend up all but the last few ingredients and pour into a bowl. Top your bowl with the bee pollen and goji berries. Enjoy! I had to cut out the back row of my muffin pan on this picture because I messily devoured one of these right as it came out of the oven. Crumbs EVERYWHERE. No, that’s not my shameful secret. The secret is that the original recipe for these muffins comes from the newest batch of beachy treats from the Tone it Up girls. “Who are they?” you might ask. Meaning that you have never been a woman with a mission to look better naked and hours of internet time to spend searching for just the thing to get you motivated to FINALLY eat right and work out regularly. Good for you. I think I stumbled onto the Tone it Up website after a meal of grilled cheese sandwiches and ice cream. I wasn’t feeling to good about myself and the website’s impossibly girly aesthetic drew me right in. It was a nice change from all the paleo sites I usually frequent. It’s run by Karena and Katrina, a pair of Southern California best friends and personal trainers whose mission is to help you become a “beach babe”. Yeah, I kind of wanted to barf, too. But I also kind of wanted to BE them. So I kept visiting the website, joined the online community, and coughed up a stupid amount of money for their nutrition plan. Never mind the fact that I almost never go to the beach and when I do, it’s in Oregon so I’m dressed like this. With my mom, in July. Oh well, everyone has to have their guilty pleasures and the muffins are pretty good. Preheat oven to 350F. Line 12 muffin cups with paper liners. In a large bowl, mix together flour, xylitol, brown sugar, salt, baking powder, protein, and cocoa powder. In a separate bowl, mix bananas, maple syrup, stevia, milk, coconut oil, and flax seeds. Mix baking soda and apple cider vinegar together in a small bowl, let fizz and add to the wet ingredients. Add wet ingredients to dry ingredients and stir until just blended. Fold in walnuts. Divide batter among 12 muffin cups and bake for 25 minutes. A few months ago, my mom shared her new diet theory with me. It goes like this, if you want to eat something unhealthy, you have to make it yourself. You want french fries? Fine, go buy yourself some russet potatoes, cut them up, fry them, season them, and enjoy. While I’m not sure I’m totally on board with this idea (I could see myself getting into some major trouble, especially during weeks when I’m not too busy with work) I can see the sense of it. It allows for indulgences, but not for fast or processed food. It also allows for more quality-control on ingredients. 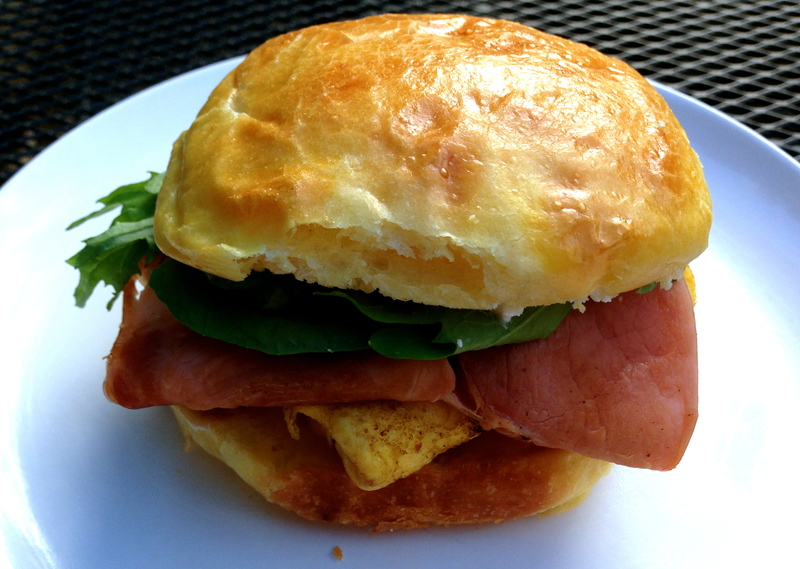 I decided to put my mom’s theory to the test when I decided to make Saveur’s incredible-looking Ham, Cheese, Egg and Lemon Sandwiches this week. And, yes, I wanted to use brioche like the recipe called for. So instead of heading to a local bakery, I headed to the pantry and ended up with one of the most satisfying meals I’ve had in my new home. Here’s how to do it in yours. First, make the brioche. I’ve been playing around with my sourdough starter recently and I decided I’d try using that instead of yeast. I found this recipe online and it worked like a charm. I had to start the day before in order to have time to reactivate my starter and for the dough to have a nice, slow rise in the refrigerator. 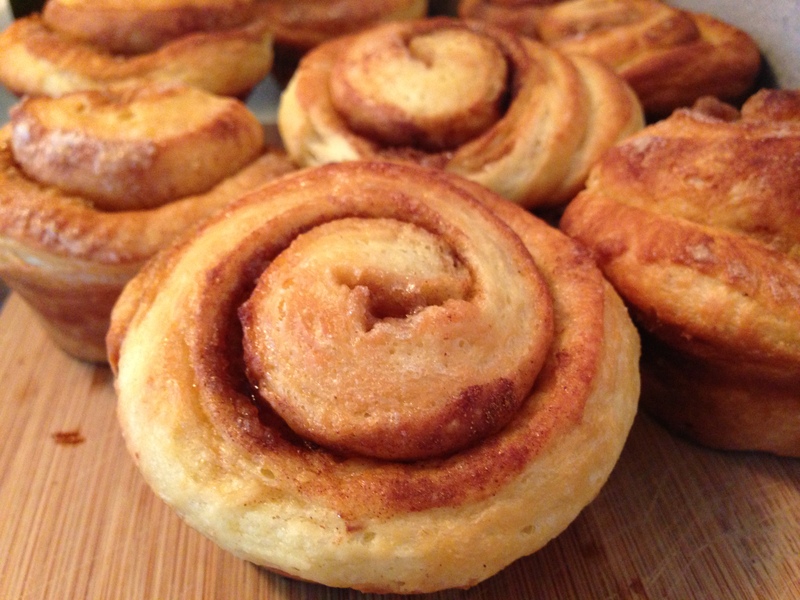 The next morning, I formed the rolls, let them rise again, and baked them in the afternoon. The buns were impossibly soft with a moist, airy crumb. Yes, there is a lot of butter in there. But I used pastured butter instead of conventional, which is rich in Omega-3 fatty acids, CLA, and Vitamins A and K2 among other things. I resisted the urge to try and add whole wheat flour to the dough because I didn’t want to risk making them too dense. I’ve had recent sourdough baking experiments fall flat (pun intended). Before moving forward with my grand sandwich plans, I had to make a cinnamon roll detour. 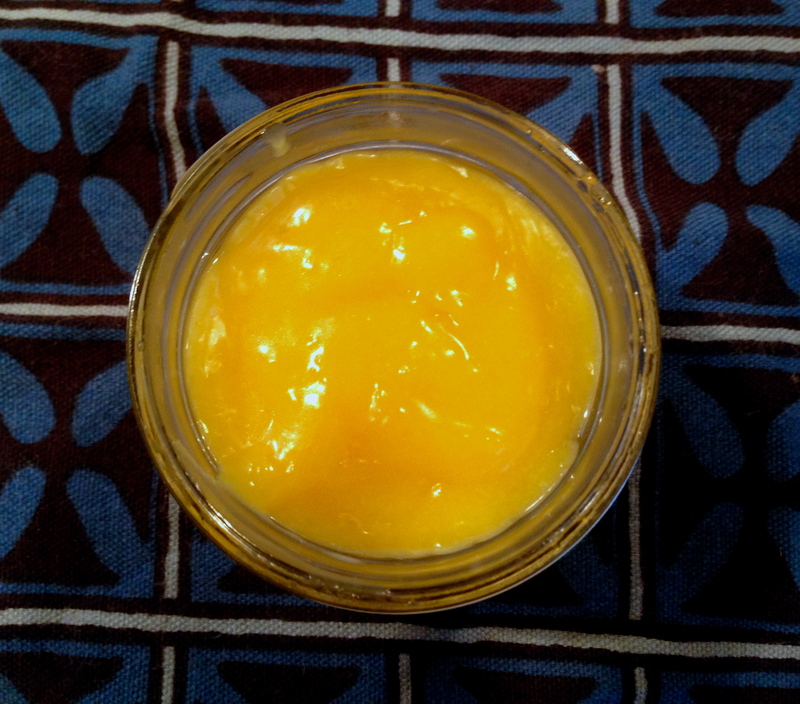 With the bread situation handled, it was time to move on to the lemon curd. I only made about 1/4 the recipe, a choice I may regret since this stuff is so darn tasty. Phew! Ok, now it’s time for the next step. For me it was going to the gym. And when I got home, it was sandwich-time. 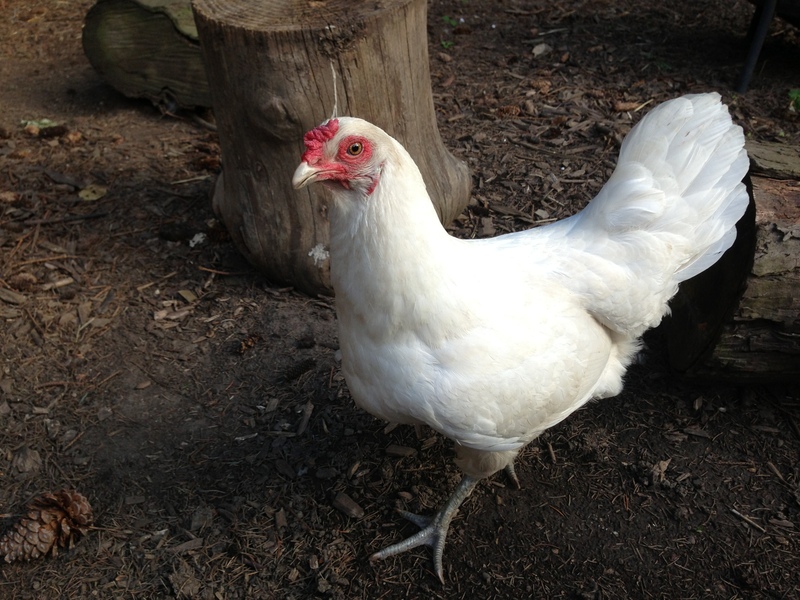 Our neighbors’ chicken was very intrigued. Please share your favorite homemade indulgences! Melt butter on a skillet over medium heat. Toast brioche, inner surfaces down until golden and crispy. Transfer to plate; spread goat cheese on bottom half and lemon curd on top half. In a bowl, whisk the egg. Add to heated skillet and cook like an omelette with thyme, salt, and pepper inside. Fold the omelette into quarters and place on top of goat cheese. Place ham in skillet and cook just until nice and warm. Place on top of the egg, followed by salad greens. 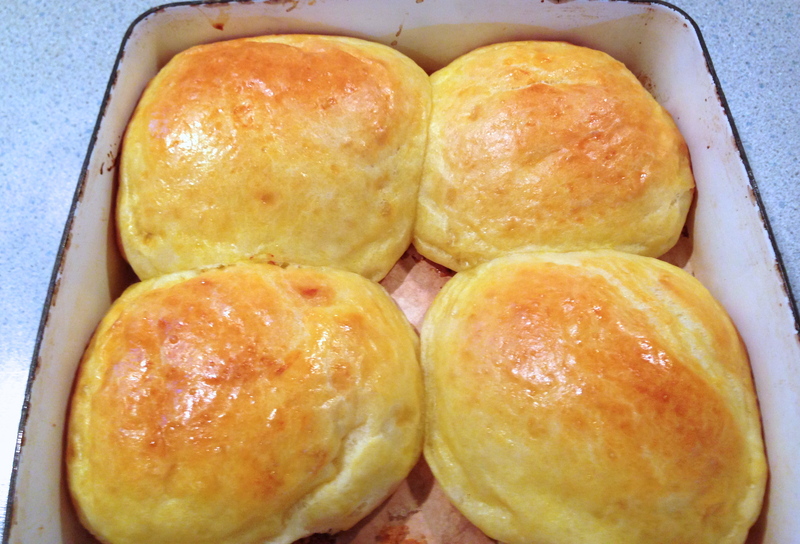 Place the second half of brioche bun on top. Whisk all ingredients together in a saucepan until smooth. Place over medium-low heat and cook, whisking frequently until curd starts to resemble pudding, about 8 minutes. Transfer to an airtight jar and chill for a couple hours before using. Well hello! It’s been quite a while since I’ve visited this little space and I have been missing it. I’m writing from a new venue today, one that I couldn’t be more pleased about. I bought my very first house in May and my world since then has been consumed with trips to Home Depot (Lord, how can I loathe a place so much? ), and ungodly amount of Benjamin Moore’s White Dove paint, and boxes. So many boxes. But here I am, enjoying our mostly unorganized/empty rooms (moving from a small 1-bedroom apartment to a house instantly solved our clutter problem!) and our kitchen, which happens to be about 5 times the size of our last one. And after weeks of eating nothing but take-out and pastries from the coffee shop, I’m ready again for some good home cookin’. I started small and simple to get acquainted with the new kitchen layout and appliances. Jeremy and I have been rediscovering the pleasures of freshly made fried eggs and toast, lemon pasta, BLT’s, and sourdough pancakes. But over the weekend, I decided to tackle something a little more ambitious. 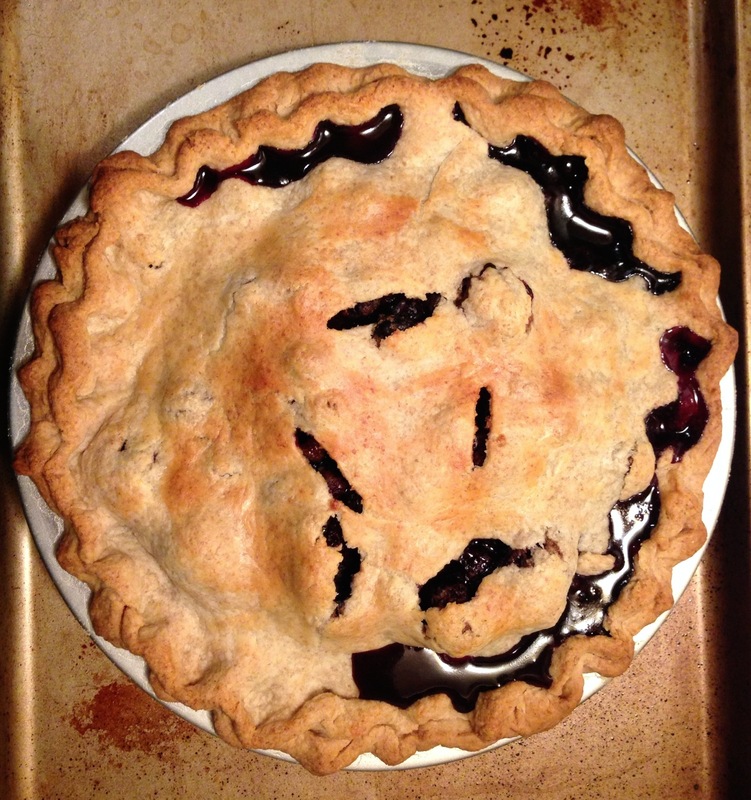 My very first berry pie. And while you’ll have to excuse my rusty camera skills and my even more rusty remember-to-take-some-damn-photos-before-obliterating-the-thing skills, I was justifiably happy with this pie. The recipe is ever so slightly adapted from Heidi’s version and that girl must know her pies if she can calmly talk me through my first double-crust venture. If you’ve been waiting for the right moment to tackle this sort of culinary accomplishment, try now. Start with 101 Cookbook’s Flakey Rye Crust here. I used the food processor technique and it came out just fine. While the crust is chilling in the fridge, mix the filling ingredients and preheat the oven to 425F. Roll out the crust to fit your pie pan (this video is very helpful). Place the bottom crust in the pan and fold over the edges, pinching a little to make it pretty. Fill with berry mixture and top with second crust. Cut off excess crust, leaving about a cm extra to fold and pinch with the bottom layer. Cut steam vents into the crust and brush with milk or cream. Now into the oven for 35-45 minutes (mine went for the full 45) until the crust is golden brown. Let it cool before diving in! I have to admit, I have not cooked dinner in a long time. Sad, yes, but all too true. Even though I am the proud owner of (and infrequent contributor to) this food blog, Jeremy and I eat out far too often. There are several reasons for this. One is simply habit. He must have realized when he first met me that one of the best ways to my heart is through my stomach, and so he treated me to some of the best meals I’d had in this foodie town. While we don’t dine quite as extravagantly these days, I guess we’re used to enjoying time out on the town with no dishes to clean up later. The second reason has to do with our having very different ideas of what constitutes an acceptable meal. Most of my creations look suspiciously like “Health Food” to him. And I turn my nose up at the nutritional value of many of his favorites. And so, we go out to bars and restaurants where we can each order what we consider to be a reasonable dinner. Yes, it’s expensive. But I was making my favorite rice pudding the other day (I needed something to distract me from the sinful pound cake air-mailed to us by Jeremy’s mom), and I realized that the recipe was not so different from risotto. Substitute broth, butter and cheese for the pudding’s milk and coconut oil, throw in some veggies, and voila(! ), a dinner treat that I knew we could both agree on. Ok, so the broccoli in there is pretty minimal, but you can serve some extra on the side if you care about that kind of thing. We had it with tomato soup and it was lovely. 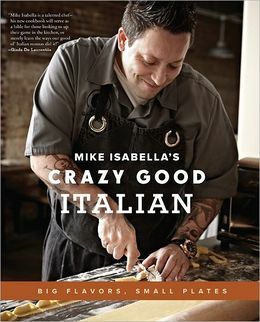 This dish was inspired by the Risotto Balls in Mike Isabella’s Crazy Good Italian. Bring water, salt, and sugar to a boil in a large pot. Add broccoli florets and blanch for 1 minute. Drain and shock in a large bowl of ice water. Allow to cool completely and place on a clean kitchen towel to drain. After about 10 minutes, pulse in a food processor until very finely chopped. Reserve 1/2 cup for the risotto, save the rest for another meal. Heat vegetable stock over medium heat in a saucepan until it is simmering. In another saucepan, melt 1 Tbsp butter over medium heat. Add onion and cook until soft, about 5 minutes. Add arborio rice and cook, stirring constantly, for 3-4 minutes, until rice is coated with butter. Add broth to rice mixture 1/2 cup at a time, stirring constantly. When one 1/2 cup is fully absorbed by the rice, add 1/2 cup more. 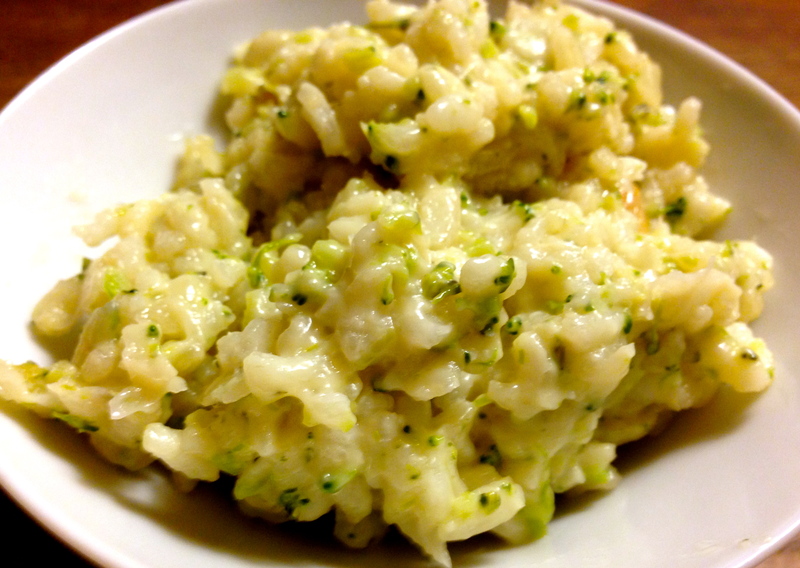 Rice will become creamy but should not be mushy. Stir in broccoli and remove from heat. Add remaining 1 Tbsp butter, Parmigiano-Reggiano, and smoked gouda. Stir until cheese has melted. Serve immediately. I have to tell you about the salad I made last night. My original intention was just to throw together something healthy, not necessarily outstanding or blog-worthy. As soon as I took my first bite, though, I knew that I would have to share this. I haven’t made a salad in a while. When it’s cold and rainy outside, a plate of raw vegetables just doesn’t appeal to me. I’m sure many of you can relate. 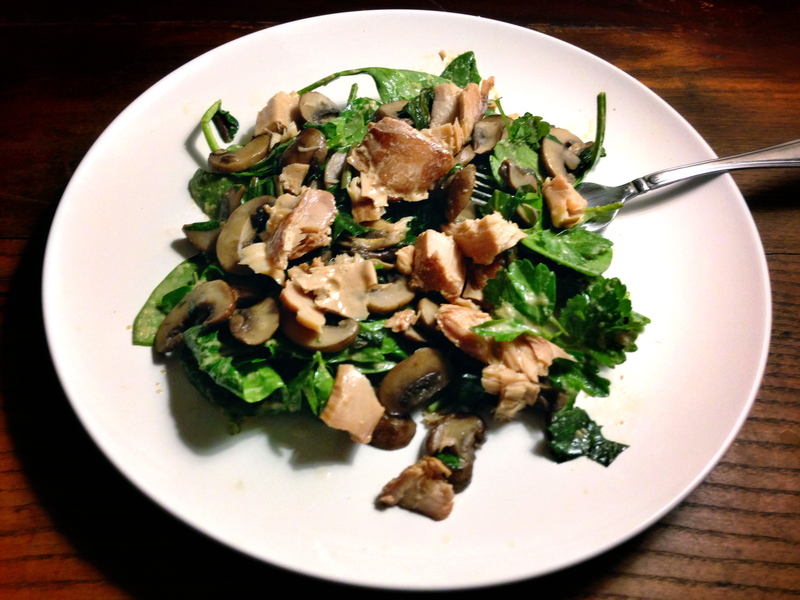 I think the secrets to this salad’s beauty are the sautéed mushrooms, which add some much-needed warmth, the lick-your-fingers good savory dressing, and the hearty smoked tuna, which I discovered a while back from a small company on the Oregon coast. I’m even looking forward to eating the EXACT same thing for dinner tonight. I hope you enjoy it too! Melt butter in a large skillet over medium-high heat. Add mushrooms and cook until softened, about 5 minutes. Reduce heat to medium, cover with a lid, and continue to sautee while you prepare the rest of the salad. Check on it and stir it occasionally. Place spinach and parsley in a large bowl. Make dressing, pour a generous amount onto greens and toss to coat. Place on a large dinner plate. 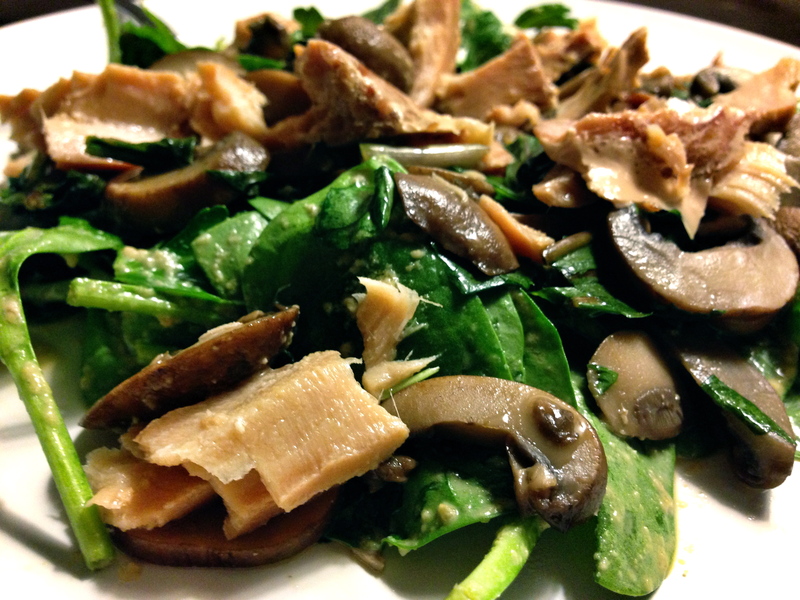 Add dandelion greens to mushrooms on stovetop. Heat, covered, for about 2 minutes until beginning to wilt. Place the mixture on top of the plated greens. Flake about 4 oz tuna over everything. Enjoy. Place all ingredients in a food processor or high speed blender. Blend on high for about 30 seconds until smooth. I shared this post with this week’s Simple Lives Thursday, Pennywise Platter, Full Plate Thursday, and Keep It Real Thursday. 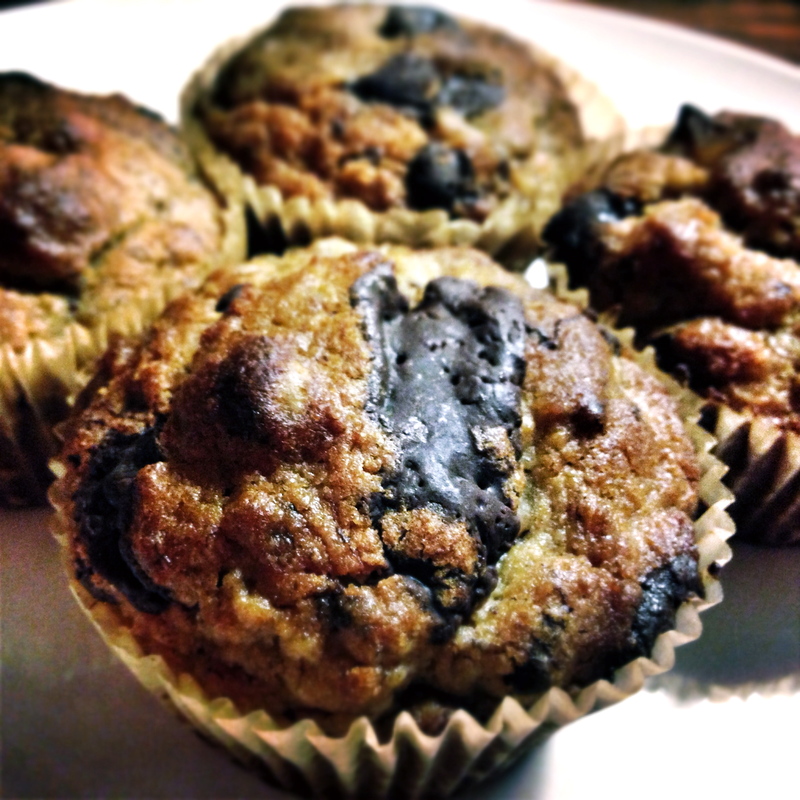 I think it’s been too long since I’ve posted a tasty baked item on this blog. I’m not sure why that is. I always seem to have some kind of homemade treat lying around the house. Perhaps the issue is that I’m always on a mission to “health-ify” my baked goods. I’ll adjust flours, fats, and sugar content until I end up with something I don’t have to feel too bad about eating every day. The problem is, I often end up with something that perhaps not everyone will appreciate. I end up with healthy-tasting cakes, brownies, cookies, etc that just can’t compete with the utterly Southern pound cake shipped to us by Jeremy’s mother. Or if I make something AMAZING it gets eaten up and I don’t take any pictures (that was the fate of a recent lemon custard pie). So I feel pretty proud about having gotten things together for this post. These muffins are good enough to inhale in an afternoon, but recent New Year’s resolutions have allowed them to stick around for a few extra days to be photographed and savored. The recipe is adapted from the gluten-free cookbook La Tartine Gourmande, which I can’t recommend highly enough. Just as in her blog, the recipes and photos are a delicious inspiration. Everything I have made from the book has turned out beautifully. 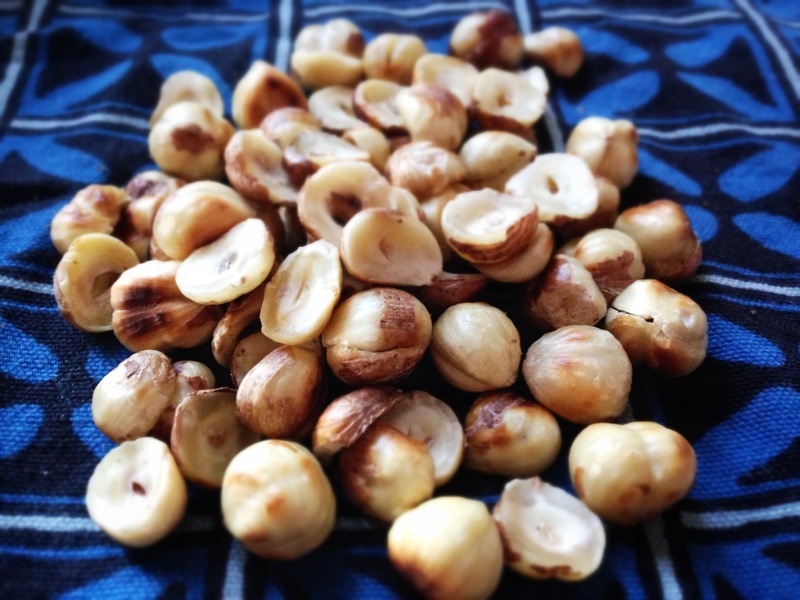 Toast hazelnuts until lightly browned. Place in a kitchen towel and roll to remove some of the skins. Roughly chop them and set aside. Preheat the oven to 350F and prepare 12 muffin cups with paper liners or cooking fat of choice. Beat eggs and xylitol together in a large bowl. Add melted butter and yogurt and whisk until well combined. In a separate bowl, combine flours, salt, baking powder and baking soda, lightly mixing. Add to the wet ingredients and stir just until mixed together. Add banana, hazelnuts, and chocolate and stir in. Divide the batter among the muffin tins and bake for 20-25 minutes. Let cool and serve with a healthy pat of coconut oil or butter. Welcome to my site! 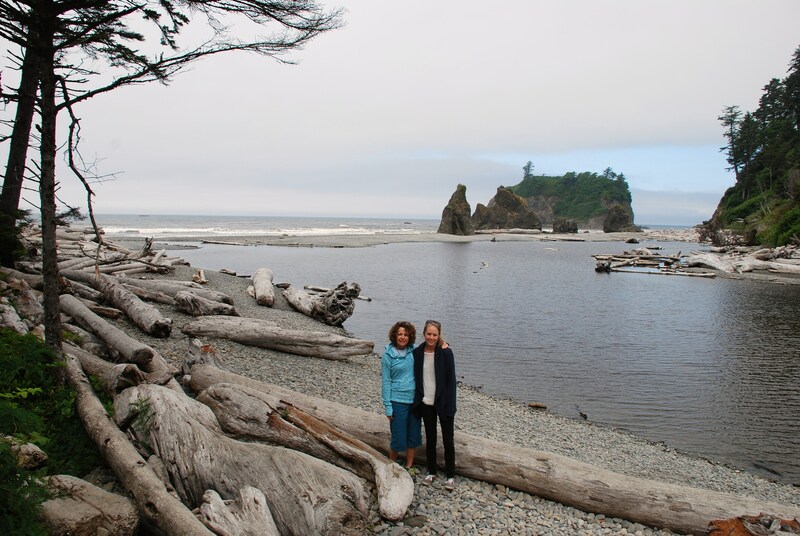 I am a Registered Nurse in Portland, OR and when I’m not recovering from night shift, my brain is usually occupied with cooking, wellness, books, and taking care of the people (and dog) who matter to me. I love food, hard-core workouts, and pretending that I could be Martha Stewart. Is that weird? Don’t answer that.